Mastervolt gel (2 V, 12 V) and Mastervolt AGM (6 V, 12 V) batteries should be charged with a voltage of 14.25 V for 12 V systems and 28.5 V for 24 V systems. The absorption phase is followed by the float phase (see 3-step+ charging characteristic on page 242) in which the voltage is reduced to 13.8 V for 12 V systems and 27.6 V for 24 V systems. These figures assume a temperature of 25 °C. For wet lead-acid batteries, the absorption voltage is 14.25 V for 12 V systems and 28.5 V for 24 V systems. The float voltage for this type of battery is 13.25 V for 12 V and 26.5 V for 24 V systems. All of these figures are for 25 °C. Lithium Ion batteries are charged with an absorption voltage of 14.25 V for 12 V, and 28.5 V for 24 V systems. The float voltage is 13.5 V for 12 V and 27 V for 24 V systems. A rule of thumb for gel and AGM batteries states that the minimum charging current should be 15 to 25 % of the battery capacity. During charging, you usually continue to supply power to connected devices, and this power consumption should be added to the 15-25 %. This means that a 400 Ah battery bank and a connected load of ten amperes requires a battery charger capacity of between 70 and 90 amperes in order to charge the battery in a reasonable time. The maximum charging current is 50 % for a gel battery, and 30 % for an AGM battery. Mastervolt Lithium Ion batteries can be subjected to much higher charge currents. However, to maximise the lifespan of the Lithium Ion battery, Mastervolt recommends a maximum charging current of 30 % of the capacity. For a 180 Ah battery, for instance, this means a maximum charge current of 60 amperes. Ensuring the longest possible lifespan for gel, AGM and Lithium Ion batteries requires a modern Mastervolt battery charger with a three-step+ charge characteristic. These battery chargers continuously regulate charge voltage and charge current. For wet gel and AGM batteries, it is recommended to have a sensor for measuring the temperature of the battery. This adjusts the charge voltage to the temperature of the battery, extending its lifespan. We call this ‘temperature compensation’. Because devices such as refrigerators are always drawing power from a battery, even while it is being charged, Mastervolt’s temperature compensation includes a maximum offsetting effect to protect the connected devices. The compensation is at most 14.55 V for a 12 V system, and 29.1 V for a 24 V system. At very high (> 50 °C) and low (<-20 °C) temperatures, wet gel and AGM batteries may no longer be charged. Outside of these limits, the Mastervolt battery charger will continue to supply the connected consumers but not charge the batteries. Adjusting the voltage to a higher or lower temperature is not required for Lithium Ion batteries. The first consideration is the efficiency of the battery. In a standard wet battery, this is around 80%. This means that if 100 Ah are discharged from the battery, 120 Ah need to be charged in order to be able to extract 100 Ah again. With gel and AGM batteries, the efficiency is higher – 85 to 90 % – so there is less loss and the charge time is shorter in comparison with wet batteries. In Lithium Ion batteries, the efficiency is as high as 97 %. Another thing that needs to be kept in mind when calculating charge time is that the last 20 % of the charging process (from 80 to 100 %) takes around four hours with wet, gel and AGM batteries (this does not apply to Lithium Ion batteries). In the second phase, also called the absorption or after-charge phase, the type of battery determines how much current is being absorbed, independently of the capacity of the battery charger. The after-charge phase phenomenon again does not apply to Lithium Ion batteries, which are charged much faster. A battery can become prematurely defective due to the ripple voltage produced by battery chargers. To prevent this, the ripple voltage caused by a charger should remain as low as possible. The ripple voltage results in ripple current. As a rule of thumb, the ripple current should remain below five per cent of installed battery capacity. If navigation or communications equipment such as GPS or VHF devices is connected to the battery, the ripple voltage should be no more than 100 mV (0.1 V). Any more could cause the equipment to malfunction. Mastervolt battery chargers are equipped with excellent voltage regulation and the ripple voltage they produce is always lower than 100 mV. Another advantage of low ripple voltage is to prevent damage to the system if, for example, a battery terminal is not properly secured or is corroded. Thanks to its low ripple voltage, a Mastervolt battery charger can even supply the system without being attached to a battery pack. The adjacent explanation regarding the Peukert exponent shows that the state of charge of a battery cannot simply be determined based on, for instance, measuring battery voltage. The best and most accurate manner to check the state of charge is to use an amp hour meter (battery monitor). An example of such a meter is the Mastervolt MasterShunt, BTM-III or BattMan battery monitor. In addition to the charge and discharge current, this monitor also indicates battery voltage, the number of amp-hours consumed, and the time remaining until the battery bank needs recharging. One of the things that set the Mastervolt battery monitor apart from other suppliers is the availability of historical data. This shows, for example, the charge/discharge cycles of the battery, the deepest discharge, the average discharge, and the highest and lowest measured voltage. On the surface it seems easy to calculate how much longer a battery will continue to supply sufficient power. 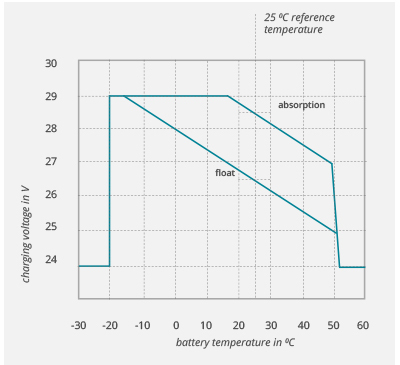 One of the most common methods is to divide battery capacity by discharge current. In practice, however, such calculations often turn out to be wrong. Most battery manufacturers specify battery capacity assuming a discharge time of 20 hours. A 100 Ah battery, for instance, is supposed to deliver 5 amps per hour for 20 hours, during which time voltage should not drop below 10.5 volt (1.75 V/cell) for a 12 V battery. Unfortunately, when discharged at a current level of 100 amps, a 100 Ah battery will deliver only 45 Ah, meaning that it can only be used for less than 30 minutes. This phenomenon is described in a formula – Peukert’s Law – devised more than a century ago by the battery pioneers Peukert (1897) and Schroder (1894). Peukert’s Law describes the effect of different discharge values on the capacity of a battery, i.e. that battery capacity is reduced at higher discharge rates. All Mastervolt battery monitors take this equation into account so you will always know the correct status of your batteries. Peukert’s Law does not apply for Lithium Ion batteries as the connected load will have no effect on the available capacity. I1, I2 and T1, T2 can be found by carrying out two discharge tests. This involves draining the battery twice at two different current levels. One high (I1) – 50 % of battery capacity, say – and one low (I2) – around 5 %. In each of the tests, the time T1 and T2 that passes before battery voltage has dropped to 10.5 volt is recorded. Carrying out two discharge tests is not always simple. Often, no large load will be available or there will be no time for a slow discharge test. You can retrieve the data necessary for calculating the Peukert exponent from the specifications of the battery. Under normal conditions, gel, AGM and Lithium Ion batteries produce little or no dangerous hydrogen gas. The little gas that escapes is negligible. However, just like with all other batteries, heat is generated during charging. To ensure the longest possible lifespan, it is important for this heat to be removed from the battery as quickly as possible. The following formula can be used to calculate the ventilation required for Mastervolt battery chargers. In our case, this amounts to 28 x 6 = 168 cm² (around 10 x 17 cm) for each opening. Lithium Ion batteries do not produce any hydrogen gas and are therefore safe to use. When batteries are charged quickly there is some degree of heat production, in which case the above formula can be used to remove the heat. Contact your installer for larger systems with multiple battery chargers.